A museum dedicated to films of secret agent James Bond is to open in Cumbria. 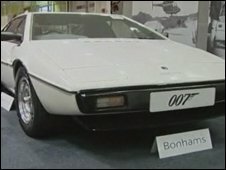 The Bond Museum will feature a host of vehicles and gadgets used in the series of action films. The collection is housed on the site of a former supermarket in Keswick and according to owner Peter Nelson it will be the world's first Bond museum. Among the highlights are a convertible Triumph Stag driven by Sean Connery in Diamonds Are Forever and the Lotus Esprit Turbo from The Spy Who Love Me. The museum also boasts a Russian T55 battle tank from GoldenEye, and the original Colibri gun from The Man with the Golden Gun. Mr Nelson, 48, has been collecting the memorabilia for 20 years through auctions and donations from Bond filmmakers EON, actors and crew from the movies. The former dentist said his fascination with Bond began at an early age. "When I was a boy I read the Ian Fleming books first of all, and they really captured my imagination," he said. "And then I was introduced to the films and they blew me away. James Bond had that sophistication and glamour and humour, all those things that as a young boy you wanted in your life." Mr Nelson, who also runs a Cars of the Stars motor museum in Keswick, said he has spent "hundreds of thousands" of pounds on the collection. The museum's opening on 5 April has been timed to coincide with the 100th anniversary of the birth of Albert "Cubby" Broccoli, the producer of the original Bond films.